BLOG: How does wavelength factor into choosing a laser? 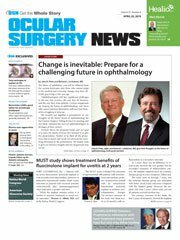 Caesar Luo, MD, focuses his blog on retina topics from practice management to treatment techniques. Purchasing a laser for your practice is a significant capital investment, but when chosen wisely, it has the potential to generate a significant return. There are a number of variables to consider when differentiating between lasers and selecting the best for your practice. To begin, consider all the applications you might utilize the laser for. Wavelength is an important first decision toward meeting your needs. When I was working in a multispecialty group, we chose the IQ 532 laser system (Iridex) for its general practicality and because most of us were already familiar with its use and expected outcomes from our training. The 532 nm wavelength is also the standard in operating rooms due to its versatility across multiple applications, it can be used for anterior segment procedures, and it is well tolerated by patients. From a purely practical standpoint, the IQ 577 laser system (Iridex) offers the best of the 532 nm and 577 nm wavelength in one unit. In recent years, the 577 nm laser has become increasingly popular among retina specialists. While early reports indicated that continuous wave yellow laser reduced patient discomfort compared with the 532, more recent studies report that there is virtually no difference in patient-reported pain levels. 577 nm produces a more targeted burn than the 532 nm, causing less laser spot expansion. There also seems to be an advantage of less luteal pigment absorption and potentially less risk when treating closer to the fovea. This is particularly beneficial for patients with dark eye pigmentation, which may uptake higher fluency than lighter pigmented eyes. From a treatment standpoint, the 577 nm wavelength may produce a deeper burn, allowing it to go below the level of the retinal pigment epithelium (RPE) to effectively treat choroidal-based pathologies including central serous chorioretinopathy (CSR) and anti-VEGF-resistant age-related macular degeneration. 810 nm wavelength was historically prevalent for MicroPulse laser therapy until MicroPulse technology was incorporated into the IQ 532 and IQ 577 laser systems; however, the use of 810 nm in a continuous-wave treatment mode continues to be used for disorders of vascular angiogenesis. 810 nm is good for transscleral procedures, ie, transscleral retinal photocoagulation for retinal tears/breaks, and for transscleral cyclophotocoagulation for glaucoma. For the most part, 810 nm is not an ideal laser wavelength for day-to-day office use. An 810 nm laser requires higher power to achieve an adequate burn, and it’s pretty uncomfortable for patients because of how deep the burn is. To ensure the comfort of patients, use of a retrobulbar block is often necessary. That said, its penetration depth makes the 810 effective for some choroidal pathologies such as CSR and AMD as well as the aforementioned indications. Safety is always a key factor. MicroPulse technology, available as a treatment mode in the OcuLight SLx (Iridex), IQ 532 and IQ 577 laser systems, delivers short pulsed laser energy that allows tissue to cool between the pulses and prevents thermal buildup and cell destruction. I like to explain MicroPulse laser therapy to my patients like looking through the slats on a long fence while driving. The slats break the view. And in contrast to continuous wave laser delivery, the tissue is spared, and thus the procedure is repeatable and titratable, which is more patient specific than destructive thermal burns. In my own practice, MicroPulse therapy has become a useful adjunct in the treatment of a multitude of retinal and choroidal pathologies. For example, I am often torn in my approach to patients who have clinically significant diabetic macular edema but excellent vision who are completely asymptomatic. The known natural history portends eventual vision loss; however, offering an intravitreal injection to these patients can be a tough sell. MicroPulse laser therapy has shown to be quite effective in my hands for this subset of patients with diabetes. Also, central serous chorioretinopathy does respond well to MicroPulse therapy. While we all have been trained to watch and wait, the known downstream effects of persistent subretinal fluid and RPE damage may argue toward earlier intervention especially now that we have a safe and effective option for these patients. If I was a patient with CSR, I know what I would choose. In my opinion, a standard 532 nm or 577 nm laser can really serve the needs of most practices. Consider pricing, and choose the wavelength that makes the most sense based on surgeon preference, patient population and applicability. Adam MK, et al. Ophthalmol Retina. 2018;doi:10.1016/j.oret.2017.05.012. Vujosevic S, et al. Curr Med Chem. 2013;doi:10.2174/09298673113209990030. Yu AK, et al. Invest Ophthalmol Vis Sci. 2013;doi:10.1167/iovs.12-11382. Disclosure: Luo reports he is a consultant for AbbVie, Alimera, Allergan, Genentech, Iridex and Lumenis and receives research grands from Allergan and Lumenis.